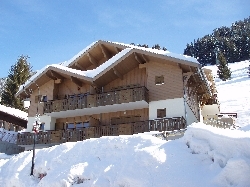 HOLIDAY HOMES TO RENT IN PORTES DU SOLEIL, RHONE ALPES. Welcome to our selection of holiday homes to rent in Portes du Soleil, France. One of the largest ski areas in the world, the Portes du Soleil is actually thirteen different villages or resorts that have combined together under one name for marketing purposes and to make it easier for skiers to enjoy a wide variety of slopes. Rather than staying in just one of these villages and having access to one set of runs, anyone staying in any of the Portes du Soleil resorts can use any of the runs in the 1000 square kilometre region. Skiers visiting the resort are well catered for, with over 600 kilometres of runs served by nearly 200 ski lifts. One of the most popular areas is a circuit, which runs through most of the Swiss villages in the area, and some of the French. The route can be skied either clockwise or anti-clockwise, but only serious skiers should choose the latter as this involves having to make your way down the slope called �La Chavanette�, an orange-rated slope which is even more difficult than the black runs. You can always take a ski lift to the bottom if you find yourself at the top having changed your mind, but skiing the circuit clockwise is probably a better idea. Although the region is at its busiest during the winter months, many of the resorts are pleasant places to visit in the summer too. Underneath all the skiing industry development, visitors can often still find the traditional Alpine village that was there first. Many of the ski lifts also run in the summer, taking hikers and mountain bikers to the upper slopes where there are dozens of trails that belong to them, and not skiers, once the snow has melted. St Jean d�Aulps is one of the resorts that also has an interesting heritage. Not only is the village itself a picturesque, typically Alpine community, but St Jean is also home to the 11th century Aulps Abbey, complete with a museum dedicated to the building�s history. The pretty town of Montriand is on the shores of a large mountain lake that bears its name and is very popular with hikers heading to the Brochaux waterfall, while Les Gets is an ideal destination for mountain bikers. Not only are there several trails in this part of Portes de Soleil, but the town also has additional outdoor facilities for bikers, such as the Jump Park, and has hosted international competitions. Looking for self catering holiday accommodation in Portes du Soleil? Then below is a selection of gites in Portes du Soleil and villas in Portes du Soleil that can be rented direct from their owners. You can either click on each listing for further details or you can use our search engine on the left if you are looking for something in particular.